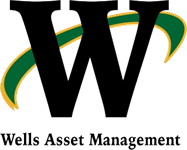 Wells Asset Management, LLC, operates under First Financial Equity Corparation, (FFEC). Securities and Registered Investment Advisory Services offered through First Financial Equity Corparation, Member FINRA/SIPC. You may obtain additional information from FFEC by going to website www.ffec.com. Should you have any questions you may directly contact your investment representative at (406-294-2808) fax to (406) 294-2808. An official copy of statements can be obtained by contacting the custodian of assets directly.